With the All Things Digital staff and News Corp parting ways, the longtime columnist is now a free agent. 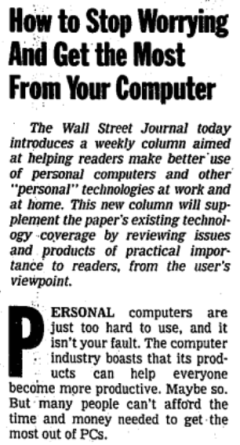 “Personal computers are just too hard to use, and it isn’t your fault,” is how Walt Mossberg began his first column for the Wall Street Journal on October 17, 1991. More than two decades later, computing is certainly easier, some of it coming so naturally that the devices seem more like appendages than machines. And that’s true even for the average consumer, the type of person who might eagerly anticipate reading Mossberg each week in the Journal. Each week, that is, until the end of this year, when his newspaper column ends. The Journal announced yesterday that it is parting ways with Mossberg along with All Things Digital, the tech news site he founded with Kara Swisher. In an interview, Mossberg said he will continue writing reviews as part of a site he plans to set up with Swisher. (It’ll need a new name: The AllThingsD brand remains with News Corp, which owns the Journal.) “I still intend to write my columns,” he said, “and I expect to be working harder than ever.” He’ll also work with additional reviewers the two plan to add to their staff. Mossberg started his career at the Journal in 1970 as a reporter in the Detroit bureau making $9,000 a year. By 2007, his annual salary was reported to be close to a million dollars, having established a popular franchise with plain-English reviews of new gadgets and software. His value, above all, is in giving it to you straight and clear. “After a week of testing the iPhone 5S, I like it and can recommend it for anyone looking for a premium, advanced smartphone,” he wrote this week. Though Mossberg gets into detail in his reviews, he doesn’t assume his readers know the difference between 3G and LTE or care about granular details of the phone’s processor. What matters is if the thing is faster. The column’s name from the start has been “Personal Technology,” which Mossberg believes he coined, though the Journal never trademarked it. That phrase, a now ubiquitous descriptor of the gadgets, captures a lot of what Mossberg intended to do with his column. In the end, it’s not about the gadget but what it does for you. Back when he started the column in 1991, he said, “The assumption was you were either a newbie or a techie. 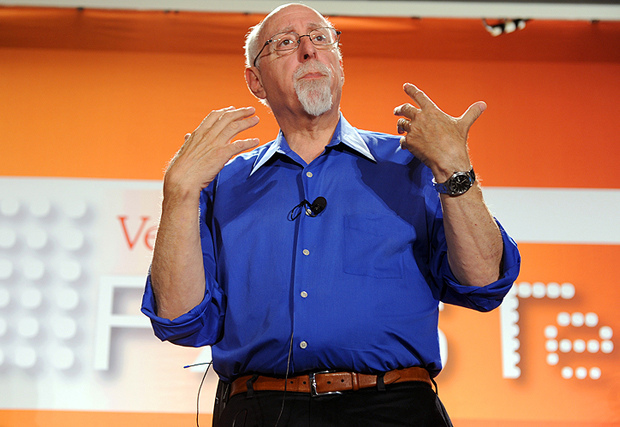 And if you were a newbie, the assumption was you were on the way to becoming a techie.” But Mossberg wanted to write for normal people who were neither. A mass-audience newspaper like the Journal was a good way to reach them. “But I still think it’s not as easy as it should be,” he said, citing his recent review of the Galaxy S4. ”I found Samsung’s software often gimmicky, duplicative of standard Android apps, or, in some cases, only intermittently functional,” Mossberg wrote in that piece, which surely drew the common complaint that he’s an Apple fanboy.